NVGRE vs VXLAN: What’s the Difference? What is network virtualization? Network virtualization is a software-defined networking process to combine hardware and software into a single virtual network. Over the years, network virtualization has always been upgrading as different virtual network technologies have popping out. It has a transitional period from dummy virtualization networking to more advanced one like virtual VLAN. Then the appearance of two tunneling protocols – NVGRE and VXLAN have brought in new network virtualization technologies. Software-defined networking (SDN) NVGRE vs VXLAN: What’s the difference? This post will introduce SDN NVGRE vs VXLAN definition, NVGRE/VXLAN network switch features and the difference between NVGRE and VXLAN. NVGRE vs VXLAN：What Are NVGRE and VXLAN? NVGRE (Network Virtualization using Generic Routing Encapsulation) and VXLAN (Virtual Extensive Local Area Network) are two different tunneling protocols for network virtualization technology. They don’t provide substantial functionality but define how various virtual devices like network switches encapsulate and forward packets. However many times people mention software-defined NVGRE/VXLAN as network virtualization technologies. Both NVGRE and Virtual Extensive LAN encapsulate layer 2 protocols with layer 3 protocols, which solve the scalability problem of large cloud computing and enable layer 2 packets exchange across IP networks. 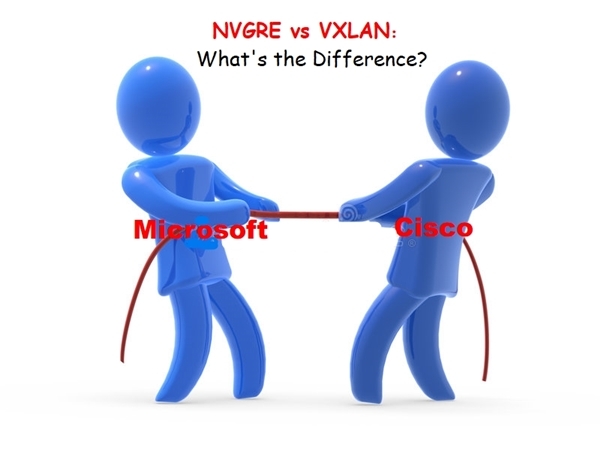 NVGRE is mainly supported by Microsoft whereas VXLAN is introduced by Cisco. The two tech giants are scrambling to make their standards become the unified standard in the industry. Both technologies change the situation of fixed VLAN size – 4096 virtual networks while creating up to 16 million virtual networks. However, VXLAN vs NVGRE deployment method and header format are quite different. VXLAN uses the standard tunneling protocol UDP to generate a 24-bit ID segment on the VXLAN header. Instead, NVGRE employs GRE (Generic Routing Encapsulation) to tunnel layer 2 packets over layer 3 networks. NVGRE header format is lower 24 bits GRE header, which can also support 16 million virtual networks. VXLAN can guarantee load balancing and reserve the data packet order between different virtual machines (VMs). However, as NVGRE needs to provide a flow to describe the bandwidth utilization granularity, the tunneling network must use GRE header. This causes NVGRE incompatible with traditional load balancing. To solve this problem, NVGRE host requires multiple IP addresses to ensure balanced traffic load. As Power over Ethernet technology booming, PoE enabled switch such as gigabit PoE switch had been invented to add PoE to networks. Similarly, software-based technologies like LACP, SND, NVGRE and VXLAN have also penetrated to hardware devices. For example, NVGRE/VXLAN enabled data switch owns NVGRE/VXLAN capability to expand VLAN size compared. Such NVGRE or VXLAN enabled switches come with different capacity ranging from 1G to 100G in the market. FS recommends S and N series high-end L2/L3 switches. Say S5850-48T4Q 48 port 10Gb Ethernet switch with 4 40G QSFP+ ports and N5850-48S6Q 48 port 10Gb SFP+ Top-of-Rack (ToR)/ Leaf switch with 6 40G QSFP+ ports. Both of the 10GbE switches support NVGRE and VXLAN to support over 16M virtual networks. S5850-48T4Q high performance Ethernet copper switch supports advanced features like VxLAN, IPv4/IPv6, MLAG, NVGRE, best fit for enterprise/data center/Metro ToR access requiring complete software with comprehensive protocols and applications deployment. N5850-48S6Q fiber switch supports advanced features including MLAG, VXLAN/NVGRE, SFLOW, SNMP, MPLS etc, ideal for fully virtualized data center. Besides, the optional ONIE type of this model supports any ONIE-enabled software to be installed in the open switch, natural fit for open network installation network. Figure 1: FS provides various NVGRE vs VXLAN capable network switches ranging from 1G to 100G. VXLAN and NVGRE are advanced network virtualization implement tunneling protocols/technologies compared with VLAN. They expand virtual networks size from 4096 up to 16 million and allow layer 2 packets to transmit across IP fabric such as layer 3 networks. NVGRE vs VXLAN differences lie in supported tech giants, tunneling method, header format and load balancing compatibility. Adding NVGRE and VXLAN capability to network switch overcomes VLAN scalability limits in large cloud computing and enables an agile VM networking environment.